The analogy to billiards applies very much to the current state of civil war in Libya. The balance of power between the eastern faction, or “Tobruk government” and the western faction, or “Tripoli government” is one, seems based more on military strength than popular support. Military strength comes from external funding, so the civil war looks more like a proxy war. Libya’s only international airport, may be captured any moment by a military force lead by General Haftar, representing the government established on the eastern side of Libya. He has the support of Saudi Arabia, Egypt, UAE and for the most part Russia. In the years following the 2011 Arab Spring uprising, the sequence of events seemed to follow the unpredictability of billiards, Yet, I believe in this case, one can argue that the table is larger than anyone could imagine, and there are many balls on the table that may not be as visible, but strongly influence the game. I note that Trump seems to believe international relations is a game of one on one poker and plays by a series of threats and bluffs. He couldn’t be further off the mark and the US has lost its role as a negotiator in resolving crises. He also seems intent on reversing as many Obama era policies, even ones that were working. He is a strong believer in nationalism, but then feels he can bully around lesser countries, such as Guatemala and Honduras. The spark that set off Arab Spring was the death of Mohammed Bouazizi in Tunisia on January 4, 2011. An autocracy is a system of government in which supreme power is concentrated in the hands of one person, whose decisions are subject to neither external legal restraints nor regularized mechanisms of popular control (except perhaps for the implicit threat of a coup d’état or mass insurrection). Absolute monarchies (such as Saudi Arabia, the United Arab Emirates, Oman, Brunei and Swaziland) and dictatorships (such as Turkmenistan and North Korea) are the main modern-day forms of autocracy. We have for decades simultaneously rallied against autocracies, and maintain friendly relations with their leaders. This includes both Republican and Democrat administrations. When the US has intervened, such as in Libya Afghanistan, and Iraq, they were based on national security issues, principally that these countries would be a danger to other countries or support radical groups in the future. We intervened in Libya, through NATO bombings to opponents of Gadaffi However, we never sent troops to Libya. Our Libyan intervention was supported by the UN Resolution 1973 passed 10-0 in March 2011. This is somewhat personal, as I was in Libya in the early part of the Arab Spring in 2011 and ultimately had to be evacuated along with a large number of expats by a British frigate. I went back in 2013, at a period of relative calm. There was a lot of optimism for a new Libya. I post a three part blog, posted on June 25 to 26, 2017. To explain recent events, it was really necessary to give some recent historical facts on the situation. I began with a simple statement, “Nothing is normal in Libya. At least, in the last 3 years, what happens doesn’t seem normal or logical to outsiders.” The three key outside players in Libya are Saudi Arabia, Egypt and UAE. There is a major rift between the public policy (UN negotiated re-unification) and their actions – namely military and financial support to the Tobruk side. The players back the strong man, not because his policies will lead to a more stable country, but because they perceive him as the likely winner in the conflict. The civil war in Libya is not about ideology. It is all about getting outside support to buy military equipment. Simply put, Money rules. General Haftar need Russia on his side. Russia seemed to be hedging its position, but I think at this point, it is firmly supporting General Haftar, because his success at capturing the oil fields held by the Tripoli government. I said in 2017, that Qaddafi’s son, Saif al-Islam would play some role on the side of General Haftar. He has been busy lining up Russian support for the General’s plan to take over the country by force, since it can’t be won in the UN negotiations. In early April, 2019, a window of opportunity opened for General Haftar. The Tripoli government lost one of its key supporters. The 82 year old president of Algeria, Abdelaziz Bouteflika, stepped down amid widespread protests in the streets of Algiers. Protesters are now attacking his replacement either, so Algeria is in chaos right now. While losing one key supporter, General Haftar’s efforts were paying off gaining another, much more important ally – Saudi Arabia. To understand this relation, it is necessary to understand Hafter shares with Saudi Arabia a a deep animosity towards the Muslim Brotherhood, because this has become an international political organization. It was instrumental in electing Mohammed Morsi to replace Hosni Mubarek in Egypt after his fall in 2011. So these are some of the factors which lead to General Haftar’s success. Next blog, I will focus more on the current situation. WHO says it fears the outbreak of infectious diseases among the thousands of families fleeing their homes in Tripoli. US Ambassador to the UN, Nikki Haley, held a reception for the “Friends of America” to thank the countries who voted against the UN resolution, condemning President Trump’s decision to recognize Jerusalem. It was a bit bizarre, as of the 193 members representing almost all of the 7.6 billion inhabitants of our planet, only 9 countries voted against the resolution. Of these 9 countries, only 5 have populations over 1 million residents: US, Israel, Guatemala, Honduras, and Togo (See list at end of this blog). Some reception! Reconsider travel to Guatemala due to crime. Violent crime, such as sexual assault, carjacking, armed robbery, and murder, is common. Gang activity, such as extortion, violent street crime, and narcotics trafficking, is widespread, particularly in the border regions. Local police may lack the resources to respond effectively to serious criminal incidents. This is Level 3 advisory. The top warning is Level 4 which advises travelers not to visit the countries and if intrepid travelers ignore this advice, the State Department suggests having a will prepared prior to travel. The only other South American countries with a Level 3 advisory (Reconsider Travel) are Honduras and El Salvador. Personally, I have nothing against Honduras and Guatemala. I have been several times to Guatemala, and each visit was fantastic. The other country, Togo, is in Africa, and has been struggling for years due to low prices for its agricultural exports. It has an astounding dense population of approximately 8 million residents. I was actually surprised at Togo’s vote, with a 20% Muslim population. So, Nikki’s party invitees of “No Voters” had one wealthy country (Israel), three countries in economic dire straits (Guatemala, Honduras, and Togo) and 4 tiny island states in the Pacific. Nauru is one of them, which has a population of 13,000 residents, whose best asset is it’s seat in the UN and a vote that comes cheap. See link below on Nauru’s recognition of Russia’s breakaway republics in exchange for aid. It is our President which is dividing up the world, through his travel bans, cuts in aid and policy decisions, to make the US disliked around the world as never before. He’s been able to sour relations with our close neighbors, Mexico and Canada. The invitees to the Haley’s reception included all those who didn’t vote at all or abstained so the total number of invitees was 64. I can see why – as the resolution was going to pass anyway, and it really had no effect except to embarrass the US. So, to be a friend of the US doesn’t take much, just sit at home on the day of the vote. Still, it was a landslide vote against the US. Usually, when you tell nation leaders that they must support US policies or else, “We’re taking names” comment by Nikki Haley, it is counter productive. The recent violence in Pakistan, is directed at Trump’s cut off of military aid. It’s regrettable as we need them as an ally against terrorism. We seem to be antagonizing both friends and enemies. We lost the chance to broker some peace settlement between Palestine and Israel, with our decision to recognize Jerusalem. South Korea seems to be making inroads to reducing hostilities with North Korea, after we exchanged increasingly higher threats with North Korea. The humanitarian crisis in Yemen seems of little importance to Trump. It is a Iran-Saudi proxy war, and we’ve sided with the Saudi’s. The Middle East countries are now more divided into the Sunni and Shi’a factions, and doing less to curb real terrorism. We may eventually undermine the moderates control in Iran, by President Rouhani, by imposing new sanctions, and threatening to abandon the nuclear agreement. In doing so, we discourage any deal with North Korea over their nuclear program. Meanwhile, the State Department continues to shrink under Secretary Rex Tillerson, with many of the diplomatic posts unfilled. Yet I consider him one of the best of the cabinet leaders. I would include Gen. Mattis at Defense as well. I would like to have seen a “Friends of the US” reception with leaders from all the continents of the world. This would require a major re-think of the America First agenda. We are “Stronger Together” the slogan of Hillary Clinton’s campaign. I’ve often thought about a service on the internet, similar to “Letgo.com” where countries could bid on the UN representatives’ vote. Maybe “Cash4votes.com” would work. Of course, the country would first have to let the world know it’s vote is up for sale. In the master plan advanced by President Trump, an unabashedly aggressive United States is supposed to retain its rightful perch as the center of the commercial universe, wielding its economic dominance to dictate the rules to the rest of global trade. As it turns out, the rest of the planet has its own ideas. Gee, what a wonderful way to say we don’t all think the same. And what sounds good, sometimes isn’t! Two beautifully written sentences in the morning goes well with coffee and toast. The rest of the article adds more details on the collaboration between the European Union and Japan on trade. It certainly adds to other stories of the day, such as the Qatar crisis, where unintended consequences can be completely contrary to the original intent of a strategy. Madeleine Albright got it right when she said international relationships should be considered more like a game of billiards rather than a game of chess. The balls in billiards are all clustered together, but when hit, they go in different directions. The political world in the Middle East seems to be in continual flux,with the Iraq and Syria conflicts, Qatar crisis and the Libyan civil war. However, the business world seems very different and much more stable, as investments in oil and gas must be made over decades, not timed to local or regional politics. It appears the business deals transcends all the political rhetoric and cultural differences, with the common goal of sound investments for the long term for the mutual benefit of all stakeholders. The Trump administration seems obsessed with blaming everything linking terrorism to Iran. It is a theme popular with Saudi Arabia, the UAE, Bahrain and Egypt, but I think now, it is a pretext for their blockade of Qatar. The only other non-Arab country with this fixation is Israel. The business world doesn’t see this as a problem. Simply put, “Money talks and nobody walks away from a profitable deal.” Even the French, who have seen more of their fair share of terror attacks. Iran and Qatar economically they have no choice, but to cooperate, as they are “joined at the hip” by a mega gas field, the South Pars (belonging to Iran) and North Dome (belonging to Qatar) field. The division of the field based on maritime agreements. Fortunately, for both countries, there is no dispute on gas ownership. The South Pars reserves account for roughly 7.5% of the world’s gas reserves and almost 40% of Iran’s total natural gas wealth. The field is the world’s largest gas field in terms of recoverable gas with a reserves of 1235 trillion cubic feet (tcf). The second largest gas field, Urengoy, in Russia has 222 tcf. The field produces both natural gas and condensed gas liquids (condensates). See links below for more details. The field was discovered in 1971, but first production did not occur until 1989. With the discovery of a mega field, why wait so long to develop? Gas discoveries are a blessing and a curse. Gas, unlike oil, can not be easily transported and sent to European and Asian markets. Gas can be liquified transported in specially built tankers. The curse is that mega gas fields require mega investments, in terms of hundreds of billions of dollars. To develop the field, Iran needed international partners from France (Total) and China (CNPC). The French company, Total, operates South Pars, which means they are responsible for exploration, development and production, but Iran and the other partners have approval authority on all activities. The Pars Oil and Gas Company (POGC). a subsidiary of National Iran Oil Company, has jurisdiction over all South Pars-related projects. Since the mid-2000s development of the field has stagnated due to a lack of foreign investment and export opportunities because of United Nations (UN) and Western sanctions against Iran. A partial lifting of these sanctions in 2015 has enabled POGC, which was established in 1998, and the government to move forward with the 24th development phase set out for the field. Total benefited from the lifting of sanctions as field development, aimed at increasing gas production could continue. As Republican candidates where crisscrossing the US, denouncing the Iranian nuclear agreement deal as the most horrible deal of the century, Total was quietly discussing with Iran on the next development phase of the South Pars field. By November 2016, Iran announced a memorandum of agreement, and in April 16, 2017, President Rouhani concluded contracts for 5 new phases of field development worth 20 billion dollars. See links below. It is expected that Iran’s production will surpass Qatar’s. All this depends on an accessible market. It is a big “if.” Iran ships its gas via pipeline. Qatar has a far reach to the rest of the world through its liquified natural gas (LNG) facilities. Qatar exports 1/3 of all LNG worldwide. Qatar supplies the UAE by the Dolphin pipeline and LNG shipments. So, the GCC countries likely could see the gas supply was going to be increasing, and both Iran and Qatar would seek ways of extending the lines of supply either by pipeline or LNG tankers. Interestingly, even though the UAE has taken the extreme position that the 13 demands are non-negotiable, the critically important gas from Qatar still flows to the UAE. The current Qatar crisis likely came to a boil, as a number of actions taken by Qatar. This includes the payment of ransom to Shite militants in Iraq which could be used to support the claim of terrorism. It also saved the lives of members of the royal family. Others have commented on the open reporting on the 2011 Arab Spring uprising by Al Jazeera, upset many of the Arab countries. A “respectful press” would have immediately taken the side of the government, not the dissenters. Qatar’s willingness to accept exiled dissidents from other Arab countries angered Saudi Arabia and the other GCC country. But, perhaps what has not received enough attention is the economic power of the tiny nation of Qatar, was on the rise. Could it partner with Iran in the future, by processing Iranian gas for LNG export? Could Qatar invest in LNG projects or construction companies? This would seem to be a perfect fit. Qatar was really understood that its hydrocarbon assets would not last forever, and it needed to diversify into other areas. Exactly what the Saudis are doing right now. In sum, Iran’s planned increases in gas production, would result in more gas development from Qatar, and a push to increase LNG processing capacity. The other GCC countries knew the rising economic wealth of both Iran and Qatar would change the balance of power in the Middle East. While Iran was too big to isolate or pressure, Qatar looked vulnerable. Qatar crisis: Have the Saudis gone too far? Production prior to 2011 was 1,650,000 barrels of oil per day. In 2016, it was 500,000 barrels per day. There is an enormous wealth created by the export of oil. With 46 billion barrels of oil, these assets will create income for decades to come. In late 2016, it looked like the beginnings of a re-unified Libya could become a reality, under the UN Peace Accords. In concept the accords were to create a new government, the GNA government, based on the Tobruk and Tripoli based governments. However, this could only become a reality if the Tobruk government, principally Khalfa Haftar, believed he could not conquer the rest of Libya, and was content with sharing power with the GNA government in Tripoli. So, peace depends on Haftar diminished capacity to extend his reach to the west, making peace the best option. The latest incident was triggered by the recent, sudden souring of relations between Qatar on the one hand and Saudi Arabia, the United Arab Emirates, Egypt and Bahrain on the other. 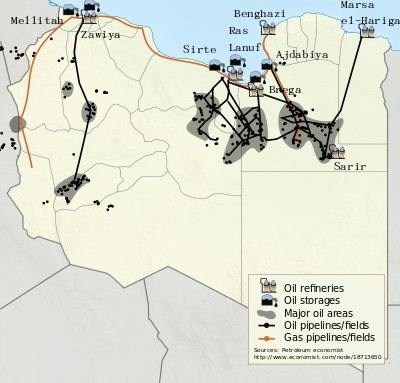 One of the several groups that purport to be Libya’s rightful government is using that dispute as a pretext to seize control of the country’s oil and gas exports: It has accused the National Oil Corporation, the internationally recognized body responsible for managing these resources, of working in the service of Qatar by diverting oil revenues to it via an N.O.C. customer. I am the N.O.C.’s chairman, and these allegations are false. But they shine a bright light on Libya’s current tragedy. Since the revolution of 2011, the country’s oil and gas resources have been held hostage to both its fractious politics and power struggles in the Middle East. It is not explicitly stated, but this is a reference to the Tobruk based government. The Chairman goes on to suggest Libya’s National Oil Company be given more authority to protect it from being involved in the political infighting. The UN’s Libya Sanctions Committee report, released on Friday [23-Jun-17} , reveals the UAE has supplied attack helicopters and other military aircraft to Haftar’s forces. “The United Arab Emirates have been providing both material support and direct support to LNA, which have significantly increased the air support available to LNA,” said the report by a UN panel of experts. The report provides rare insight into foreign funding of armed groups in Libya, which many say has exacerbated the conflict. “For too long the U.N. has been unfairly biased in favor of the Palestinian Authority to the detriment of our allies in Israel,” Haley said. It was a very strange and antagonistic statement. But, Trump was scheduled to meet with Israel PM Netanyahu at the White House on the following day. The Secretary-General quickly responded, stating they were interested in the best negotiator for the conflict, irrespective of their country, and neither the Israels nor the Palestinians had any participation in the talks. Fortunately, another very qualified special envoy has been selected. It seemed like Washington politics had meddled in what should have been a routine appointment. That’s just my opinion. If the conflict in Libya is seen, not just as the Tobruk-based east government, verses GNA/GNC west side government, but as a larger conflict of Saudi Arabia, the UAE, Egypt, Bahrain, Yemen and others verses Qatar, Iran, Turkey and Russia, where does this leave the US and our allies? The administrative breakdown in Libya has created enormous human suffering. During Gaddafi’s era, immigrants received work visas as applied by their sponsors, with set wages and approved by the government. This system has broken down, and employers are now taking advantage of workers, charging them for expenses, equal to their wages. Also, migrants are being lured across the Libyan sounthern boundary with the false promise of being able to migrate to Europe, only to be sold as slaves or ransomed. See BBC link. The only path forward is re-unification through UN Negotiations. On the Tobruk side, Chief of the Army, Haftar must not be allowed to purchase arms and escalate the war. The conflict in Libya will only become worse if the US turns a blind eye towards the arming of the Tobruk government by the Saudi supporters. Washington and the EU need to work jointly on the the massive refugee problem. This is a rapidly developing story. To follow it, it is best to do a Google search on the news. The latest story to appear, is the release of Saif al-Islam Gadaffi and some discussion that he could play a some leadership role. I have very serious doubts. The areas under control by the various rival groups seems to change regularly. The New York Times, The Guardian and Al Jazeera seem to be the best sources of information. Republicans prepared a report in June 2016 which none of the Democrats supported. They issued their separate report. But both Democratic and Republican reports and prior investigations state that the embassy in Benghazi was inadequately protected. Hillary Clinton agrees with this assessment and as Secretary of State accepted all recommendations made at the time to improve security. Of course, you are not going to hear this from Trump. The big lie is that Secretary Clinton did nothing while 4 Americans were killed in Benghazi. Not even the Republican version of the Benghazi has any conclusion remotely similar to this. The Republican report states it was impossible to save the two lives in the embassy. The discussion is on the two lives while guarding the CIA annex. This is all about an attack that lasted a total of 11 minutes. Senior Pentagon officials have consistently said that they were constrained by the “tyranny of time and distance” — that is, that the military could not have sent troops or planes in time to have made a difference. Even the report acknowledges the challenges facing the so-called FAST teams: These troops did not have their own planes, which meant delays waiting for flights; did not travel with their own vehicles (they would need to find some in Benghazi when they landed); and were designed to deploy before a crisis hit, not during hostilities. Essentially, the hypothetical rescue mission would have been sent to save the lives of two servicemen guarding the CIA Annex. More lives could have been lost in this mission. And then the Pentagon, Obama, or even Secretary Clinton would have come under serious attack. As President, she will have a lot to deal with. The most critical will be international policy, with the crises in Syria, being number 1. Syria is a complex mess, and can only be put back together by cooperation from many countries, including Turkey, Iran and Russia. Her slogan, “Stronger Together”, is the right path forward. Obama and Bush have never found a way to persuade North Korea’s leader Kim Jung-un to halt his quest for nuclear weapons. He is truly a scary leader. Libya is battling ISIS, yet the country still in broken into various factions. Donald Trump has demonstrated his ineptness with his insulting comments to Mexico. It doesn’t take much to be friends with Mexico- but he blew it big time. He seems to start little wars at the drop of a hat. Even insulting Marco Rubio, Jeb Bush, Ted Cruz’s father and many other Republicans. It is not the time to elect a president who has zero knowledge of diplomacy. This is not the job who calls our elections rigged when he’s behind in the polls. There is no on-the-job training program. Vote for Hillary to keep our nation great by working with others to find solutions. This election is a total fraud! Ok- did I get your attention? I’m not talking about the 2016 election here in the US. I’m going all the way back to 1992, in a very different part of the world, in the country of Angola in their very first open election since independence from Portugal. These six words were uttered by a representative for Jonas Savimbi, the losing candidate in the Angolan election in 1992. I was in Angola, and I understand Portuguese, so as I heard this on national television, it frighten me. I knew it was untrue. The UN had monitored the election, and while there were irregularities, it was, on balance, a fair election. What came through on that day in 1992, was the intense anger in place of a concession speech. Savimbi’s representative blasted away at the government,. declaring the entire election system was rigged. All election results were false. To Savimbi’s supporters, the government had stolen the election. If someone steals something, the natural reaction is revenge. Savimbi did not blast away at the election results. He let others do the dirty work for him. Lost in all of this was the respect for the people who worked to make sure fair elections were held in Angola. The Carter organization had helped to monitor the elections, along with UN monitors. My friend was one of the election monitors. It was a dangerous voluntary work. The trust we have in our election system, can also be undermined by politics. Hateful and dishonest rhetoric is dangerous. Volunteers from the Women League of Voters, help keep our elections fair and honest. What followed in Angola, was a resumption of a civil war, which lasted until year 2002. So people died believing in hateful lies.